Cars honked their support as students rallied against the budget cuts on Main Street, Menomonie. A group of 15 students gathered Wednesday, April 1 beneath the clock tower on the North side of Bowman Hall. They came to the rally in response to a Facebook page created by the Stout Student Association (SSA). The rally was organized in order to voice concern about the $300 million budget cut to the UW System. The University of Wisconsin–Stout faces just less than a $6 million loss from state aid if the proposal goes through. 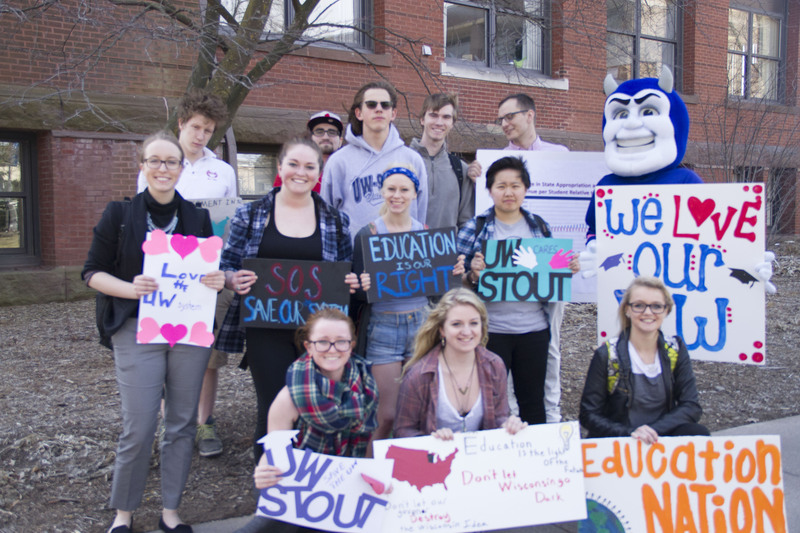 Students carried signs and chanted phrases such as “we love Stout,” and “S.O.S. : save our system!” Signs were provided by the SSA, but some students made and brought their own. The rally marched for 13 blocks going east on Main Street, taking a left at Burger King onto East 6th Street. They continued marching south until they reached 13th Avenue. From there, they made their way to the main entrance of the MSC where the march ended.